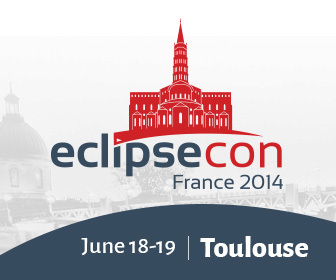 EclipseCon France: Don't Miss the Early Deadline! We're excited about the great program for EclipseCon France: workshops, sessions, Ignite talks, and intriguing keynotes from two very different speakers. The registration price goes up after May 18, so save some money and sign up now! The Eclipse Working Groups Unconference is happening the day before, and lots of new plans have been added to the wiki page. See what's happening, and propose your own idea. We are updating www.eclipse.org to give it a fresh new look. Please check out the prototype site and provide your feedback here. The interactive Eclipse Events map will help you locate all sorts of Eclipse gatherings: DemoCamps, Eclipse Days, Hackathons, Training Series, and more! Events are now being scheduled year-round, and world-round. All the information you need is right on the map. We are asking the members of the Eclipse community to participate in our annual Eclipse Community Survey. It will take 5-10 minutes to complete, and we would really appreciate your participation.